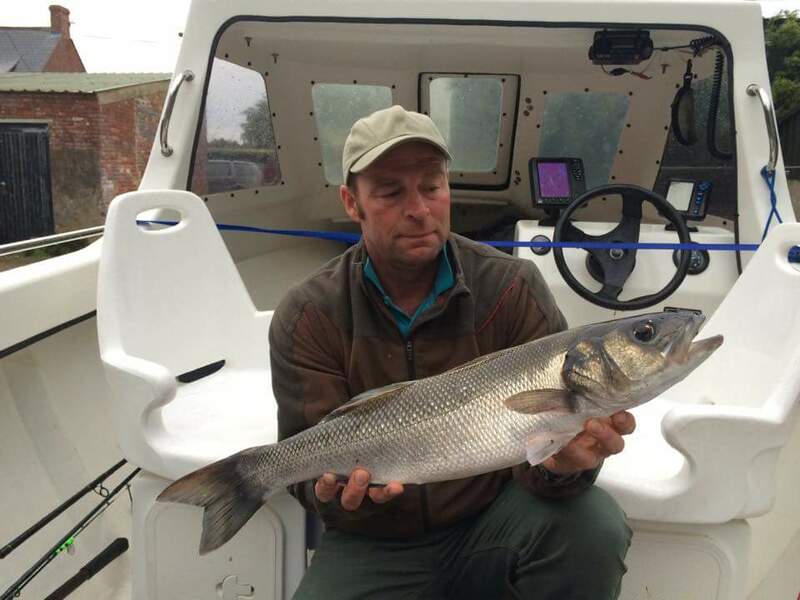 As our own Sean McSeveny has pointed out in recent articles there seems to be a distinct lack of fish in some areas around the south coast. I myself spent 10 hours at Chesil beach with only one modest black bream on worm to show for my efforts. The makrel on the other hand were around in abundance so it was good to target the shoals close to the shore line. Having taken only what I needed, I then sat back and watched the natural cycle of life as the makrel drove the whitebait onto the shingle. In turn as the tide rose the dead whitebait were mopped up by the mullet cruising up and down with tide. With Chesil beach blowing hot and cold, as it so often does. I decided on a trip a bit closer to home as I had heard reports of the odd good fish being landed at Sandbanks. With low water around 9pm the aim was to fish one of the groins either side of slack water at the same time catching the “magic” hour at dusk when the fish often become more active. Using gripper leads I was able to hold bottom even though the tide was running quite hard however the downside to this was, I was picking up half a ton of weed with each cast. The weed was a mixture of Japanese weed and eel grass. The eel grass stunk of amonia a sign that perhaps the summer bloom is starting to die. With an hour to go until low water my lead broke out and started to trundle off down tide. Strange I thought, as the lead had been holding all through the tide until now. I picked up the rod and reeled into another heavy load of weed. After what seemed like an hour cleaning weed off the leader knot I made my way onto the weed around the weight and hook. To my surprise I found I was connected to a plump plaice splashing around in the shallows. What a result, just a shame I didn’t know I had it on due to the weed on the line! 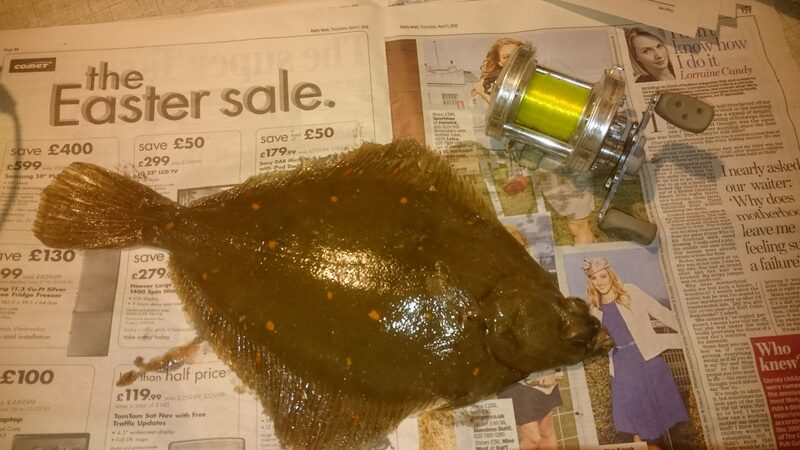 I release most fish I catch, but this was a fat plaice around 1.5lb with thick fillets. It was very tasty! 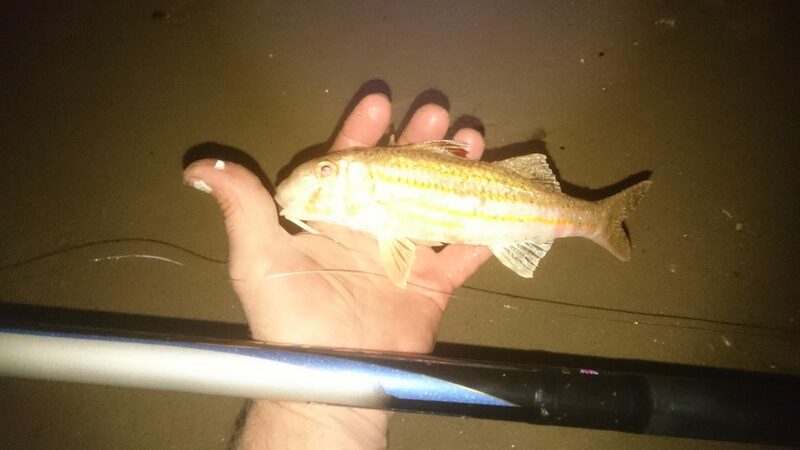 As slack water came and went I switched to a plain weight. This allows the bait to move around with the tide finding fish holding spots. I had several rattles which soon resulted in a nice red mullet. My first for Sandbanks! I have heard of another plaice being caught nearby that day however that doesn’t necessarily mean that they are back in numbers. It’s just that Sandbanks is a venue where you stand a good chance of catching one of any size at any time of year. Off the back of that success I will be fishing there again although all the marks around Poole are now fishing very well. This weekend Southbourne should produce some good sole along with ray, red mullet,bass and gurnard. Milford shingle bank will produce well, though a smaller tide will be more comfortable to fish on. 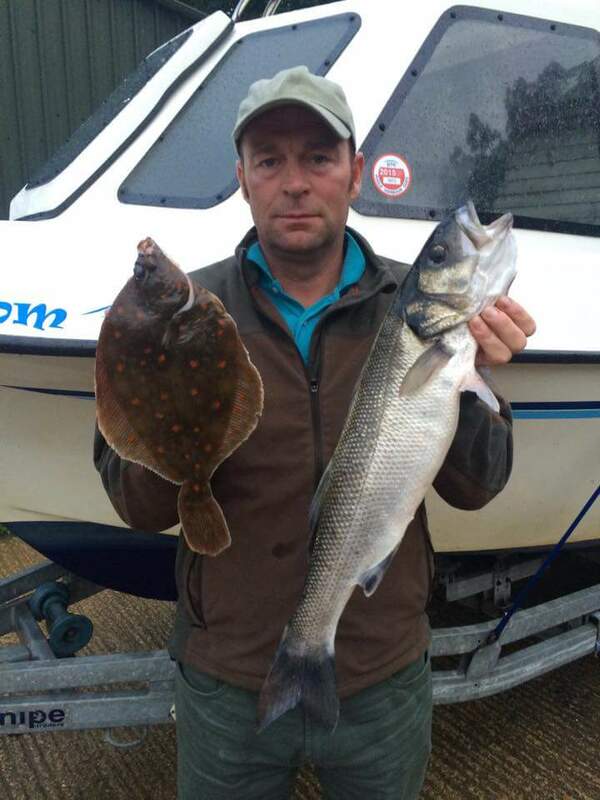 On the boats in poole harbour Alex Hardwick is still finding good fish. 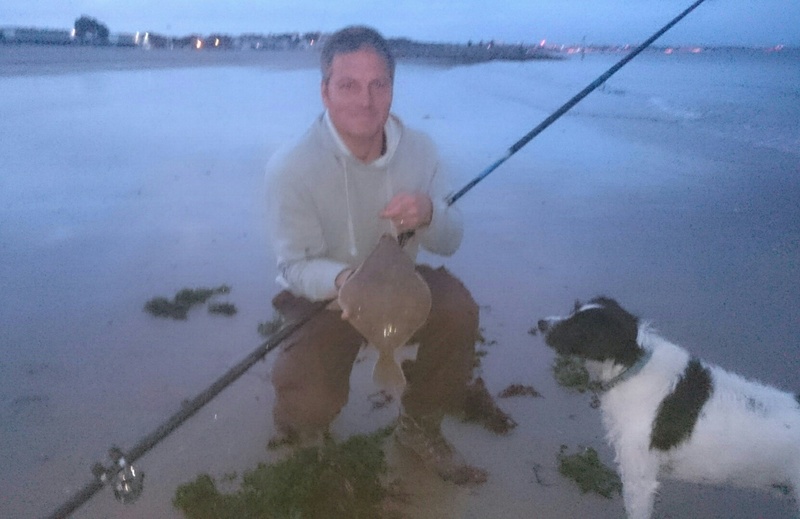 Plaice to 1lb8oz and Bass 4lb7oz on the drift along the harbours channels. It won’t be long before the flounder make an appearance, but that’s another story! Now is the best time to target all the summer species and I still have some spaces available during the evenings and a few Saturdays left for longer guiding sessions.